Iwo Jima | Page 3 "The Battle of Iwo Jima: 70 year anniversary"
In retrospect, the quote seems almost too cinematic, as if a Hollywood screenwriter handed a one-sentence script to James Forrestal for the moment he reached Iwo Jima. The secretary of the Navy landed by ship on the Japanese island on Feb. 23, 1945. Four days earlier, 30,000 U.S. troops, most of them Marines, had invaded the heavily defended speck of volcanic rock 750 miles from mainland Japan. Another 40,000 came ashore over the following month in a battle remembered as one of the deadliest of World War II. At Iwo Jima’s southern tip stands its tallest point, Mount Suribachi, peaking at 554 feet. 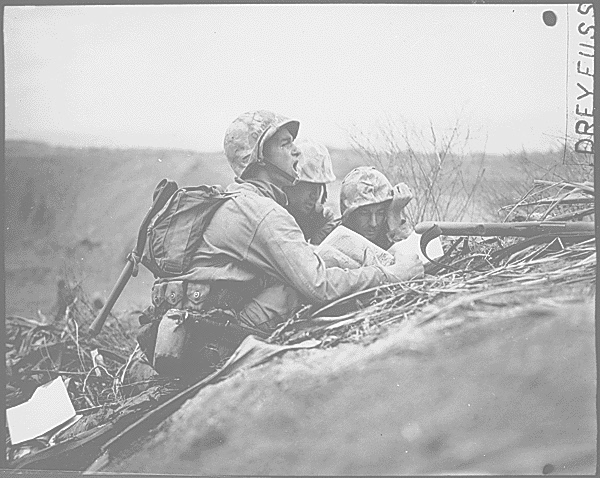 The morning of the secretary’s arrival, amid fierce fighting across the island, a Marine platoon climbed to the summit. As a handful of its members lifted a 20-foot-long water pipe topped with a small American flag, Forrestal, watching from the beach below with Gen. Holland Smith, spoke the line that enshrined him in military mythology. His words resonate as a source of historical pride within the Corps 70 years later. In Marine lore, the island siege counts as one of the Homeric battles, alongside Belleau Wood in France in 1918, Chosin Reservoir in Korea in 1950 and Hue in Vietnam in 1968. Lt. Gen. Holland M. Smith, right, commanding general, Fleet Marine Force Pacific, who commanded the Marines in the seizure of Iwo Jima, congratulates Maj. Gen, Graves B. Erskine, commander of the 3d Marine Division on the for breaking the backbone of the Japanese resistance on the island. The photo was taken after the official flag raising on Mount Suribachi. But it was what Forrestal did after his remark that ignited a series of events that elevated his prediction to, perhaps, something closer to a self-fulfilling prophecy: He asked for the flag. Lt. Col. Chandler Johnson, the battalion commander who had sent the platoon up the mountain, wanted the flag for his unit. In the popular version of the tale, when told of Forrestal’s request, Johnson barked, “To hell with that!” He instead ordered another group of Marines to bring a second, larger flag to the summit that could be delivered to the secretary at a later date. So was born the most famous photo of the war, and possibly in all of U.S. history. Five Marines and a Navy corpsman raised the second flag on Suribachi that afternoon, a scene captured by Associated Press photographer Joe Rosenthal. His image wound up on the front page of hundreds of newspapers and virtually overnight became a national emblem of courage. The country’s visceral reaction to the photo created an opportunity for the smallest of the armed services to shape an outsized identity. Marine leaders realized that with a single image they could tell — and sell — a narrative to America that would redefine perceptions of the Corps and captivate recruits, politicians and Hollywood. They saw a chance to cultivate an enduring aura for the Marines and turn Forrestal’s 500-year forecast into a fait accompli, and in the ensuing decades, the Corps, once the nation’s least respected military branch in public opinion polls, has evolved into its most prestigious. “The photo’s message was, ‘We can take any amount of suffering for the country and win the battle,’ ” said Aaron O’Connell, author of “Underdogs: The Making of the Modern Marines Corps,” and an assistant professor of military history at the U.S. Naval Academy. Those public-relations efforts received an early boost from President Franklin D. Roosevelt, who sought to exploit the popularity of Rosenthal’s photo to rally support for the war. At Roosevelt’s behest, a painting of the image, above the slogan “Now — All Together,” graced the posters and billboards that anchored the nation’s seventh war bond drive in spring 1945. In six weeks, the government raised more than $26 billion, the largest amount among the eight bonds issued during the war and nearly twice the projected total. The campaign saturated America in the blood-soaked saga of Iwo Jima. More than 6,800 U.S. troops were killed and some 19,000 wounded, with the Marines absorbing the vast majority of the losses. Japan’s strategy to fight to the death cost the lives of nearly 19,000 Japanese soldiers. The battle ended on March 26 and marked the only time in the war that the overall casualties of the invading force surpassed those of the enemy. Soon after the bond campaign, the U.S. Post Office depicted the flag-raising photo on a three-cent stamp, reinforcing the image in the nation’s collective memory. In Rosenthal’s shot, which won the Pulitzer Prize for photography in 1945, each man is visible only from the side or back. The vantage point obscures individual identity, yet together they emerged as the face of the war. The country’s sudden veneration of the Corps proved vital in the dawn of the post-war era, when the Marines were engaged in another kind of struggle for survival. President Harry Truman hastened the war’s end when he authorized the dropping of two atomic bombs on Japan in August 1945, five months after the Battle of Iwo Jima. The Marines countered with a two-pronged publicity offensive that parlayed the goodwill inspired by Rosenthal’s photo. A wounded Marine is evacuated from the front lines for medical treatment in March 1945 during the Battle of Iwo Jima. Sixth Fleet ships storm toward Iwo Jima’s beaches at the opening of the battle on Feb. 19, 1945. Wounded Marines are helped to an aid station by Navy corpsmen and fellow Marines on Iwo Jima during the 1945 battle. Landing crafts bring the first waves of invading Marines at the onset of the Battle of Iwo Jima on Feb. 19, 1945. Marines take up their positions at 9 a.m. Feb. 20, 1945, the day after the Battle of Iwo Jima began. A gun pumps a stream of shells across the litter of Iwo Jima’s black sands, Marines shell Japanese positions. From left, Pfcs. Willie J. Kanody, Elif Hill and John Alexander take a break during fighting at the Battle of Iwo Jima in 1945. Two Marine privates hit the deck after throwing a scorching inferno at the Japanese defenses as U.S. troops attempt to take Mount Suribachi in 1945. Marines sit atop a pile of spent brass at an ammo supply point. Marines of the 5th Marine Division inch their way up a slop on Red Beach No. 1 toward Mount Suribachi on Feb. 19, 1945, the opening of the Battle of Iwo Jima. In Hollywood, Corps officials collaborated with filmmakers on “Sands of Iwo Jima,” a dramatized account of the battle starring John Wayne as a Marine sergeant. As recounted in “Underdogs,” Corps consultants selected combat footage from Iwo Jima for the film and rewrote a pivotal scene to make Wayne’s character more appealing. Hundreds of Marines appeared as extras, and Gagnon and Hayes, along with Bradley, re-enacted their roles in raising the flag. The Corps’ marketing campaign for the movie’s release in 1949 reached into high schools and department stores, and the Marines set up lobby displays in theaters that included blow-ups of Rosenthal’s photo. The film finished among the year’s top 10 in box-office revenue and earned four Academy Award nominations. Meanwhile, as “Sands of Iwo Jima” played in theaters, Marine liaisons screened another film in the offices of federal lawmakers in Washington. “Bombs Over Tokyo,” a 19-minute promotional documentary produced by the Corps, chronicled the war in the Pacific through combat footage and showed the flag going up on Mount Suribachi. Norm Hatch, a Marine photographer and Iwo Jima veteran who worked on the film, brought “Bombs” to Capitol Hill, lugging along a 16mm projector and portable screen. The pincer attack launched from Hollywood and the Beltway succeeded. Truman yielded to public and political sentiment while complaining that the Marines “have a propaganda machine that is almost equal to Stalin’s.” The Corps remained intact, and when North Korea invaded South Korea in 1950, Truman dispatched Marine units to aid the fight. The photo’s universal symbolism transformed Iwo Jima into a shared experience for Americans. Their familiarity with the image deepened the impact of “Sands of Iwo Jima” and “Bombs Over Tokyo,” and the films fortified a sense of loyalty to the Corps. The Marine Corps War Memorial pierces the sky outside the entrance to Arlington National Cemetery in Virginia. The 78-foot-tall, 100-ton bronze sculpture, completed in 1954, recreates the flag-raising tableau, reflecting the symbiosis between the Marines and Rosenthal’s photo. “Nobody calls the statue by its official name,” Ford said. Rosenthal’s photo also seared the island invasion into Corps culture. The Marines seized on the image’s emotional potency for recruiting purposes, reproducing the picture in ads and brochures, while drill instructors invoked the battle during boot camp. Author Bing West, a former assistant secretary of defense, deployed to Vietnam as a 26-year-old infantry officer in 1966. He recalled trainers emphasizing that weeks of fighting — and dying — followed the raising of the flag on Mount Suribachi. America’s most recent wars offered evidence that the influence of Iwo Jima persists among Marines. In his 2013 book “The Leader’s Code,” Donovan Campbell, a platoon commander who served in Iraq, described an exchange with his 19-year-old radio operator after the unit’s first sustained firefight. Another soaring tribute to the raising of the flag accents the National Museum of the Marine Corps that opened in 2006 in Triangle, Va. A stainless steel spire attached to the roof extends 210 feet at a 60-degree angle, replicating the tilt of the metal pipe in Rosenthal’s image. The museum’s collection holds both flags that flew above Suribachi in 1945. In the end, James Forrestal, the secretary of the Navy who coveted the first flag, received neither of them. Marine leaders, aware of the country’s response to the photo, recognized that the flags belonged to history — and might make possible Forrestal’s vision of a Marine Corps for the next 500 years.